(Bracebridge, September 21, 2017) – Now that it’s autumn, the Muskoka Oldtimers Hockey Club is getting ready for its other well-known event, the annual Fall Food Drive for the Manna Food Bank. On the Tuesday before Thanksgiving, every year for about a quarter-century now, the Oldtimers have spearheaded a community-wide food drive for Manna. This year the date is set for Tuesday October 3rd. 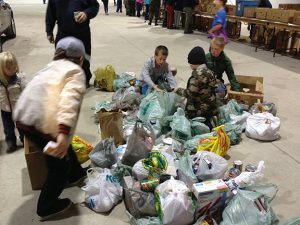 Starting at 5pm that evening, dozens of Bracebridge school kids will “blitz the town,” going door-to-door collecting non-perishable food donations and cheques that residents leave in bags outside their front doors. Laden vehicles then make their way to the Bracebridge Fairgrounds where dozens more volunteers unpack and sort it all in preparation for another winter. The depth of community engagement in this annual come-together is something to be proud of, says Rob Fraser, lead organizer for the Muskoka Oldtimers. “This has become a tradition for many, with as many as three generations in some families participating,” he notes. In addition to all of those who donate, many students volunteer as runners, about 60 Oldtimers and other community stalwarts do the driving, and dozens more from local groups, businesses and churches help out at the Bracebridge Fairgrounds. Fraser is hoping that this year will be another record-breaker. “We would love to collect even more than last year, when residents donated 14,500 pounds of food and $2,400 in cheques,” he says. 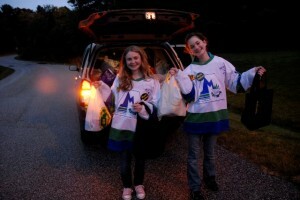 To keep the runners running, please bag your donation in advance and set it outside your front door by 5pm. If your house gets missed, please contact Manna at info@mannafoodbank.ca or 705-646-0114 to arrange a pick-up, or drop it at one of the donation bins, located all-year-round at Food Basics, Gagnon’s Your Independent Grocer, the Bracebridge Sportsplex and at the Town offices at 1000 Taylor Court. If you have questions or would like to participate in the Fall Food Drive as a volunteer, email Rob Fraser at rob.fraser@tldsb.on.ca. You can also learn more about the Oldtimers, and sign your hockey team up to participate in their tournament, on their Facebook page at www.facebook.com/muskokaoldtimers. Located at Unit 12 – 345 Ecclestone Drive, the Manna Food Bank is open Tuesdays and Fridays from 1-4pm. Manna helps about 700 local families every year. Manna is entirely volunteer run and gratefully accepts donations all year around. You can make a donation online at www.mannafoodbank.ca through CanadaHelps, either one time, or you can set up a monthly donation. Serving Muskoka since 1989, The Manna Food Bank is a registered charity (Reg: 89007 2390 RR0001). Tax receipts are issued for financial donations.